Claim: forget CO2, it's the Methane and CFC's that will drown us in the ocean | Watts Up With That? Uh, no. Natural sources for Methane and CO2 are well known, and have been around for millennia. Wetlands, termite activity, and the oceans themselves would have to cease and stop emitting Methane and CO2 for the day when “the world completely stops emitting greenhouse gases into the atmosphere”. Of course when you are a well-known alarmist (Susan Solomon) with a PlayStation™ style climate model, such things in the real-world are outside your scope of experience. 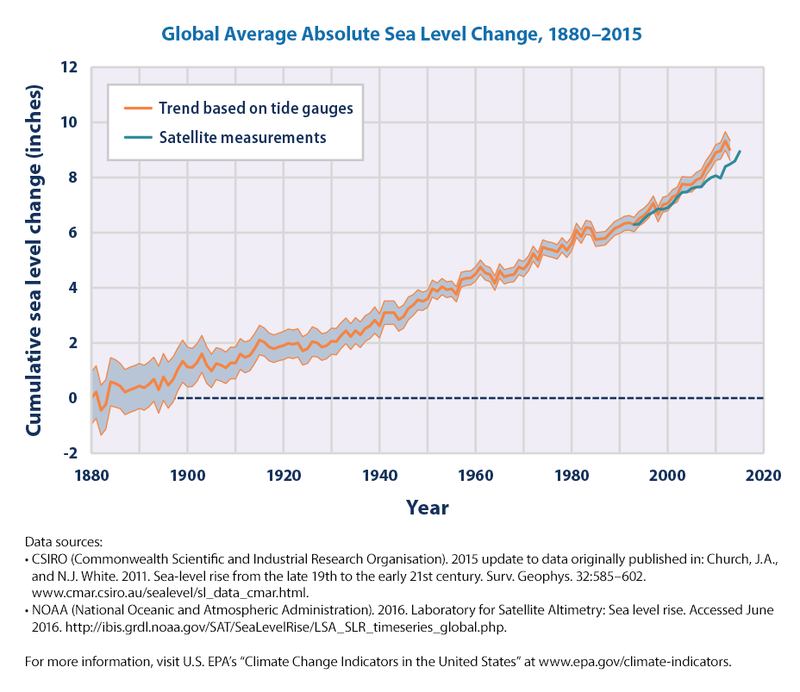 NEXT, let’s take on the claims of sea level rise being driven by methane and CFC’s. CFC’s weren’t invented until the 1930’s by Thomas Midgley, so they aren’t likely to be the cause of global sea level rise as measured by tide gauges up to the 1930’s, which is still going at about the same rate today? But, let’s believe a model over observed data, yeah that’s the ticket. 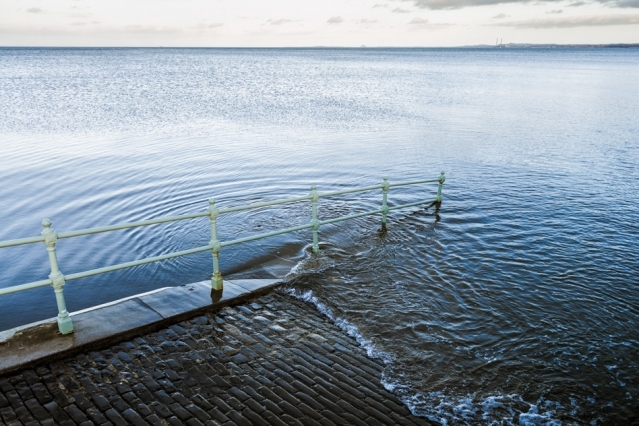 One last thing: the picture provided by MIT is of a boat launch ramp, it’s designed to handle fluctuations in sea level! Sigh, they can’t even come up with a credible photo to push their alarm story. January 9, 2017 in Alarmism, CFC's, Methane, Sea level. Residence time and half life? What about missing carbon? Or is the fact nature is dealing with carbon dioxide? The half-life of CO2 and methane in the atmosphere is about five years. And the half-lives of other “greenhouse” gases are mostly just as short. They love to lie about residence times and claim some sort of (fantasy) lingering effect even after they are gone. Just junk science being foisted on the public. The IPCC and NASA say that CO2’s half-life in the atmosphere is 200 and 1000 years, respectively. That is the only way they can get their fatally flawed models to even begin to look like they work. Sad. Do not forget that the ozone scare was based on fabricated science that said that CFCs broke down ozone at the very low temperatures found in the Antarctic upper atmosphere. Dupont had an already patented refrigerant all ready to go as soon as the evil version (the refrigerant that had gone out of patent) was banned. Dupont made a fortune and people died. Twenty years later, a short time after the current refrigerant went out of patent, we find out that the “science” demonizing the CFC was fabricated by one scientist paid by Dupont. Not to let a scare go to waste, the alarmists now would like us to believe that the ozone layer at lower than -20 deg C can warm the Earth’s surface, defying thermodynamics more egregiously than the original bad science claiming that the upper tropical troposphere at -17 deg C warms Earth’s surface at 15 deg C.
What also needs to be appreciated is that CO2 only absorbs in two small regions IR radiation wavelengths. The rest of the IR given off by Earth’s surface passes through unopposed. Water vapor absorbs a wider range of IR radiation, but also overlaps one of CO2’s bands, which lessens both of their effectiveness in those ranges. All the rest of the IR passes unopposed. It matters not that half of the re-emitted IR is downward as Earth’s surface is always warmer and thus the downward IR is rejected/reflected back upward to be lost to space. The bottomline to all reputed greenhouse gases is that they being colder cannot warm a hotter body. It’s that simple. Simply not possible. There is the chance that a small amount of IR radiation is converted to heat in the lower atmosphere by absorption of IR, but during daylight this process including absorption, emission, and heat in and out are a wash. Even if there was a small, likely negligible heating of the lower atmosphere in daylight (unlikely but being generous here), it is during the night that these “radiative gases” get revenge by actively converting atmospheric heat energy to IR unopposed by any energy input. This is why the atmosphere chills so quickly after sunset and why breezes kick up so quickly in the shadows of clouds on sunny days with scudding clouds. Methane is at about 1 ppm, 1/400th of CO2. With its short half-life in the atmosphere, methane is a non-issue. 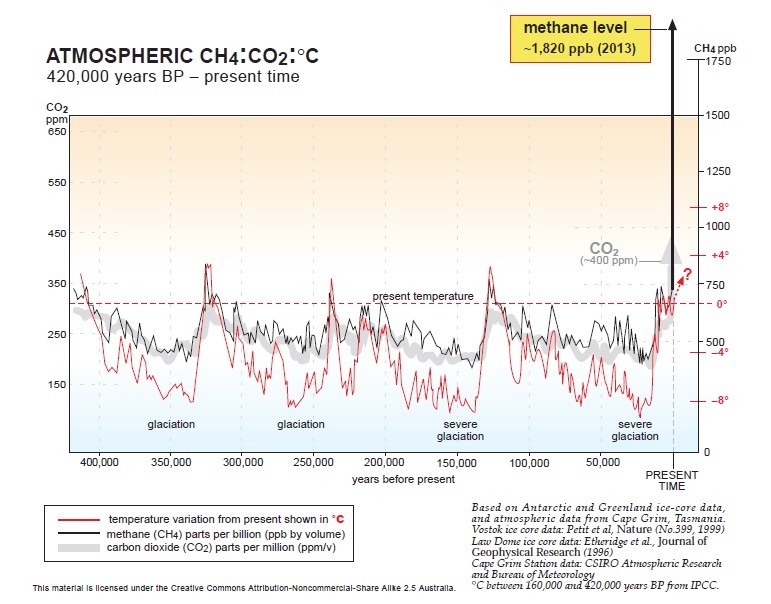 Clathrates and methane leaks mean nothing as processes keep the atmospheric concentration very low compared to CO2, which in itself is not a warming threat. Thus, methane and other reputed greenhouse gases are harmless, particularly as they are present in tiny fractions of that of CO2. The climate alarmists are trying to find every means possible to shore up their totally failing junk science. We can only hope that people notice that the alarmists are constantly changing their explanations and perceived threats as real scientists demonstrate that the junk science is junk science. As long as the media and the shill science mags give the alarmists real play in the news and publications, we have to keep pointing out their many hypocrisies when ever we can. Nature is dealing with CO2 by hiding it in trees! Sneaky devil! Methane? That is the answer. Methane clathrates are pressure stable binary solids..when continental glaciation drops sea level, reduction of hydrostatic pressure causes dissociation and release of methane. Likewise with rising sea levels, more stability of clathrates prevents dissociation and favors more sequestering of carbon in methane. Twice as much carbon exists in clathrates than in all other fossil fuels combined. Those clathrates are extremely stable and have accumulated at deep pressure for millions of years. They won’t be release by anything short of a miracle. Forget the effect of a few tenths of a degree at the Earth’s surface. I had a friend who was a geologist, well, not really “friend”, but a guy in my training group back when I was with the US Ski Team. We ate lunch together once a week for a few ski season, otherwise I didn’t see him socially. I brought up the subject of clathrates one day and he listened politely as I went off about how we should be developing undersea methane. He calmly explained that I was a complete idiot and that no energy development company would go near clathrate deposits with existing technology because they’d blow up explosively as soon as they were hit by a well casing connected to the surface. I expect he was right after thinking about it a bit. So, there’s a clathrate “ice” under 4000′ of seawater, you try to connect a drill rig to it and it almost immediately (and rapidly) decompresses into an explosive gas. I can’t imagine that being much fun. Still, I’d imagine something might be done to mitigate that. Maybe maintain high pressure in the casing before taping the deposit? There has to be a way around that. There’s a big pony in that room for the folks who figure it out. Maybe I should mention I was a technical diver back then and my idea was to build a deep sea habitat and process the deposit at depth. Expensive, but a whole lot less expensive that mining H3 on the Moon. solomon and zickfield are on the high end of the shrill factor in climate science and they have been saying for years essentially that we have already emitted enough co2 to kill the planet (and that therefore there is nothing we can do about it except for “negative emissions”. they make their fellow alarmists nervous because their brand of alarmism does NOT imply that we must cut emissions. cutting emissions is the snake oil. climate science is the sales pitch. It seems she is saying that after I turn off the heat under my pot of water on the stove, it will continue to heat. I have a hard time accepting that. You neglected to multiply by the Magical Thinking Coefficient. DHR, It seems to me that the heat is staying at the Hotel California, it can check in, but it can never leave. Close, Hotel California is were “you can check OUT anytime you like, but you can never leave”. multiplier. You know what? That’s probably true. increasing at a rate of around 6.5 ppb per year. 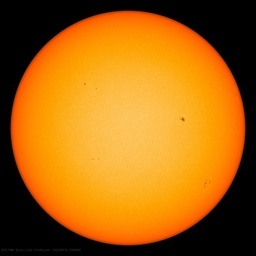 1850/2.75 = 673 ppb CO2 is the equivalent mass of 1850 ppb CH4. CH4 which at a yearly rate of 6.5 ppb per year will take around 300 years. a problem? Is this really going to send up sea level? the making, but when you look closely at the numbers, it’s difficult to come to that conclusion. CO2 only amounts to a fraction of a percent. IIRC, ppm is mass, not molecular. Gas concentrations are generally expressed as volume fractions, even when the terms ppbv or ppmv are not specified. Most of the gas quantitative analysis methods that I have used respond to effects of the gas volumes in the sample compared to to gas volumes in a standard cylinder. Standard gases may be prepared by partial pressure, gravimetrically or by a combination of the two, however the certificate of analysis will report relative volumes. Oh sure! You’re using math! This is science! Good post but it has been found that the calculations of the climate sensitivity are too great by more than a factor of 20 because a doubling of CO2 will slightly lower the dry lapse rate in the troposphere. I thought the 1963 test ban treaty gave us a good measure of CO2 decay with C14–about 20yrs. There isn’t any of the CO2 Soloman put into the atmosphere in 1990 still around to heat us up. Because the equilibrium level has risen slightly above its apparent average value of 283 PPMV during the period covered by Eschenbach’s study, the time constant and half life are very slightly shorter – I guess half-life of 39-40 years and time constant of 56-58 years. There is the matter of the Bern model, which says that the half-life of the decay of an injection of CO2 into the atmosphere is faster early in the decay of CO2 level (less than 40 years), slower later (more than 40 years). That is mostly caused by the CO2 gradient in the upper ocean decreasing as CO2 near the surface moves to deeper levels. The long term and permanent components of the Bern model depend in part on heating by the CO2 that remains in the atmosphere, so they will be less than IPCC and most touting the Bern model say in the likely event climate sensitivity to change of CO2 is less than IPCC expects. This means that after the growth of the logarithm of CO2 concentration significantly slows and especially when CO2 concentration eventually levels off and reverses, the half-life will increase and become longer than the 39-40 years I mentioned above, but the increase of half-life won’t be as bad as most using the Bern model say it will be. MIT….Massachusetts Idiot Training….at least in “climate matters”. Is it just me or have models replaced the scientific method? Models have apparently replaced logic and knowledge. There is a difference between science ( with validated models) and Science Fiction (without validated models). Well, you have to figure those models are expensive Doug. 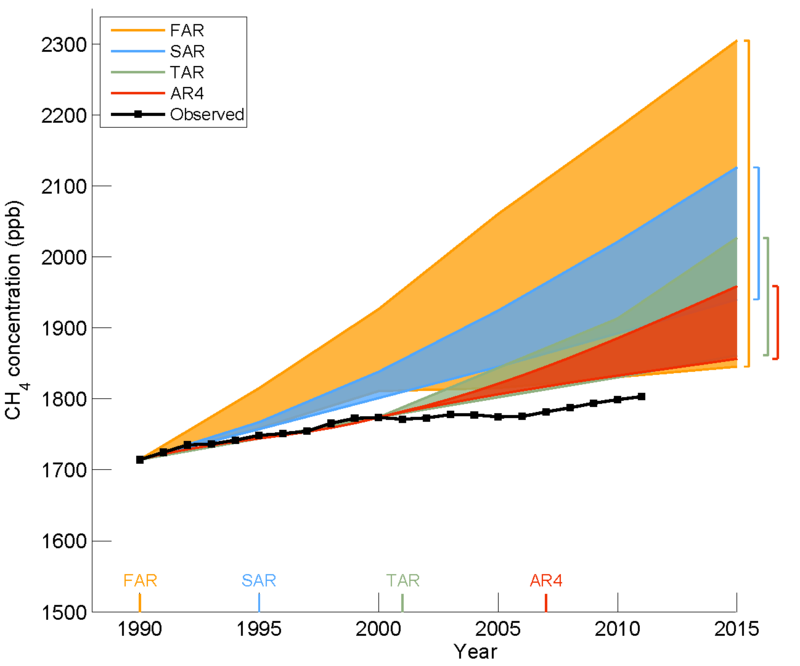 These days anything expensive must be valuable, so climate models are valuable. QED. I think this is complete bullsh!t. Methane has the same chance of heating the oceans as carbon dioxide – NIL. LWIR cannot heat water below the first few microns, which would probably cause loss of heat by evaporation. LWIR heating only the top few microns causes a temperature gradient across only a few microns – which means the heat gets conducted to a deeper level in only a few seconds, even faster than it can be removed by evaporative cooling. Churning by waves will take the heat farther down in the near-surface ocean. Apart from what Donald has said – It doesn’t have to “heat it”, in order to increase the OHC. – it can also be heated by it being prevented form coming out as easily. In the case of a calm sea, the heating of the ocean skin decreases the deltaT to the water just below (the skin is lower than just below because of evap. ), and so the heat flux through the skin to the atmosphere. That Stevenson article is 17 years old. This is what has happened since…. Toneb, your graph doesn’t say what it’s based on, but implies it’s a model (you have CMIP5 in the legend). 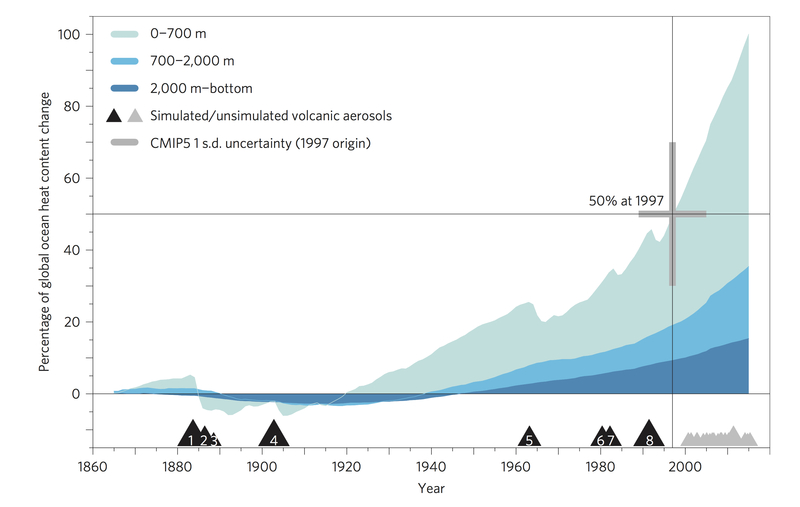 I’m curious about where measures of ocean temperature at 2000m came from in 1880? Tuvalu and Ozone again?! Never let it be said Solomon and her army of dedicated IPCC-niks are not totally dedicated to the art and artifice of “recycling”, eh?! Mind you, this recycling may serve as a useful distraction from the IPCC/UNEP’s biggest flop: the much vaunted purported perils of our dreaded CO2 emissions. Furthermore, it has the additional benefit of being a useful distraction from the very real problems of the millions of refugees in the Middle East – whose current sad status can in no small measure be attributed to yet another failure on the part of the ever-growing arms, elbows, hands & fingers of the send-more-money-now crowd at the UN. I think Ms. Susan Solomon hardly qualifies for the tag of “naïve”. to in e-mails in the ClimateGate I and II releases. She even served as one of the gatekeepers for the IPCC. Live like a caveman, or else your boat ramps will be submerged. “As the heat goes into the ocean, it goes deeper and deeper, giving you continued thermal expansion,” Solomon explains. What is Solomon really saying here? Heat goes into the ocean and causes expansion. OK. Then the heat goes deeper, causing more expansion, on and on. The response of the “scientific” Global Warming community is telling. The community could quietly encourage Solomon tone down the nonsensical hysteria. The community could back away from an obvious crank. Instead, Solomon is given “Rock Star” status, is on important and high visibility commissions, and can publish literal scientific nonsense in the most prestigious journals. This, to me, speaks of the corruption of the field, as much, or more, than anything that came out of ClimateGate. Would you care to explain why? It should be easy enough for even a troll to understand. She’s claiming that the same unit of heat first expands water at the surface, then travels to deeper layers and causes them to expand. If that heat leaves the surface, then the surface will cool and hence contract. One unit of heat can only do one unit of expansion. She is saying, as anyone, who is recognises that Solomon is a scientist (and therefore does rather know that your inference is NOT scientific) – that as the heat entering the oceans at the surface warms ever deeper waters, then (ergo) those deeper waters will expand. “If that heat leaves the surface, then the surface will cool and hence contract. But, but, the oceans are continually being replaced by more heat at the surface. It is a flux you see. That is why the WHOLE depth of the oceans are heating and NOT as a series of warming/cooling cycles from above. 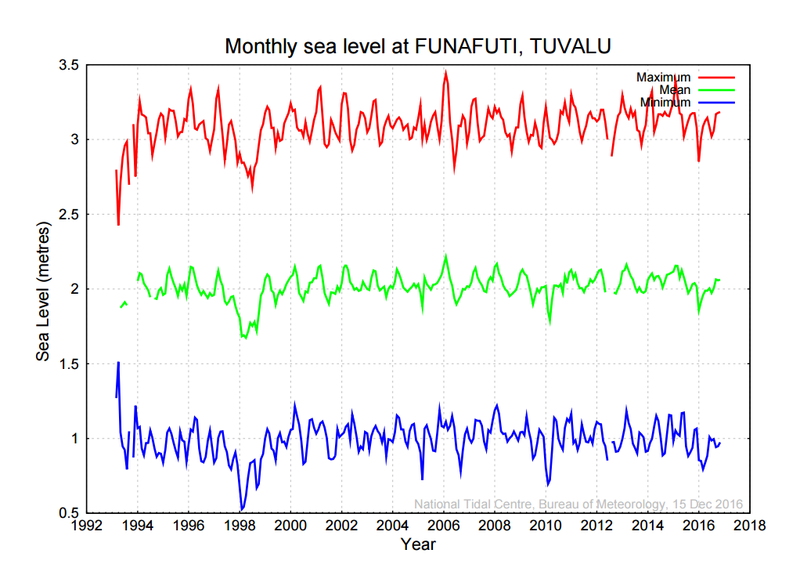 Maybe you are confusing this article which is about ALL oceans with the ENSO. Which does have a warming/cooling cycle. Oh, and a “Troll” is someone who has nothing substantial to add to the discussion and merely posts to annoy. Not merely someone who you disagree with. Else I could, plainly, reciprocate that epithet. Once again, Toneb’s argument boils down to: She’s a scientist, therefore she can’t be wrong. Toneb, I know I’ve made this comment already about the graph you published, but it isn’t really “substantial” given it doesn’t say what it is, it’s just a sort of nice looking graph that implies the entire planet is doomed? A pulse of heat going into the ocean will cause a pulse of warming. The heat does not “goes deeper and deeper, giving you continued thermal expansion,” Solomon explains. Solomon is saying that a single pulse of heat causes continuous expansion expansion for a long time. Fair question: Have I misinterpreted what Solomon is saying and come to an unjustified conclusion? No!, she doubles down on the “continuous warming” theme with methane. She also claims heat coming out of the oceans is 10x to 100x slower than heat going into the oceans. In a coupled atmosphere-ocean system, the two rates just can not be that different. Apparently, in her model, heat transfer is essentially a one-way ticket. years to decades to heat up, centuries to cool down. And with the heat causing continuous expansion the whole while. I disagree – see above. Yes, she is correct – that is what will happen with an imbalance of energy into the oceans at the surface. If the oceans cannot pass on their heat content as received at the same rate to the atmosphere – then the oceans will store that heat. And yes, essentially one way. When an imbalance is set up in the energy in vs energy out equation. There will be a flux created. If it were the other way round and the Earth was cooling then there would be a cooling from the top down in the oceans. A one way flux. In that case out. Toneb, what imbalance? We are specifically talking about if the increase in methane stopped after a certain time frame. If it stops, the imbalance also stops. Unless you believe that the warming caused by greenhouse gasses is so astronomical huge that it takes centuries to equalize. Which frankly isn’t compatable with any of the projections for Global Warming. This is frankly one of the stupidest things about ‘Climate Science’ they simultaneously want to tell you that greenhouse gasses have a huge effect on near term Global Temperature and also that it will have a continuing effect for centuries to come. It’s how they get these stupid figures with half a dozen degrees C or more. Pure fantasy. But please Toneb, post your silly graph again that doesn’t even list how much measured warming it supposedly shows. How much is a single unit of ‘percentage of global ocean heat content change’ when it shows up on a thermometer? Because unless I’m reading that wrong, all that shows is the difference between when you started measuring and when you stopped. It could show 1 degree, 10 degrees, or 0.00001 degrees. It would still be 0 percent at the start and 100 percent at the end. Did you really think we’d fall for that, Troll. Solomon, a leading wizard behind the ozone hole scare, practically incriminates herself with this publication. And she’s at MIT! Is it any wonder MIT is in the CAGW bag? The damage scientists like her, and she is a seriously credentialed scientist, do to science with half-wit notions like the one expressed here, is getting toward the incalculable stage. Is this noble cause corruption? Confirmation bias? How can a serious scientist be so easily fooled? Tuvalu? A complete hoax. “How can a serious scientist be so easily fooled?” : She is not fooled, nor is she a fool. I submit that Solomon knows exactly what she is doing. Well, here in Ontario, we shut our coal fired generating plants, but that’s ok. We’re buying hydro power from Quebec. You know, that place where they damn up rivers. Which kills plant life. Which creates methane (see above re: how many more times it is worse than CO2). But hey, nobody is actually doing math, are they? You have got it wrong, Cal. Oh, do tell, drive by commenter. As in, what do I have wrong? That dams don’t kill plants? That dead plants don’t cause methane? That methane isn’t more dangerous than CO2 when discussing climate science. Never been impressed by any MIT grads I have met in the wild. For one, once admitted you cannot fail. And there is a video where recent grads are asked if they could make a lightbulb illuminate using a battery and one wire. I’ve met both kinds – some extremely good and very impressive, some in over their heads and obviously terrified everyone knows, which they do. It’s a mixed bag, just like any other sizable population, possibly with a higher general mean, but wide enough tails to the distribution as well. Give me a pair of wire cutters and I could pull it off. Place one end (either) of the battery against the bulb bottom & touch the wire ends to the other battery end & to the metal “ground” of the bulb. A few years ago someone here in Ontario, Canada (finally) realized that many university grads actually need the kind of practical experience that community colleges give them, so they created hybrid courses. Theory isn’t everything, and these days, book learnin’ is so politicized that its not even that. Barack Obama’s musings on Climate Change. Regarding the graphic of comparison of IPCC predictions of methane in the atmosphere and actual atmospheric concentration of methane: I think this is worth updating, because the IPCC projections extend to 2015 and the last year for actual is 2011. This would show an upturn in the black curve in the above graphic, very close to meeting the low end of the range covered by some (and not all) of the color bands representing predictions presented by IPCC. WUWT, April 15, 2014 in Modeling. Right like the United Nations believe all this Bull Shine. Using the Precautionary Principle we must act as though this is true. The risk is too great to wait for conclusive evidence. Therefore we must adapt to climate change. GHG restriction is of no meaningful benefit. It follows that the external costs of GHGs are now zero. Thus using the cheapest energy is the only appropriate policy response. How else can we adapt to these changes? I am a retired ceo of my own company. missions. His application of the principle would have put me out of business. capitalism, which is their real goal. Okay, I seriously considered it and came to the conclusion that I cannot go back in time to undo past emissions. If there are centuries of sea level rise already build into the system, the only logical thing to do is not worry about it since there is nothing that can be done to stop it. There is no reason to spend billions trying to prevent something that cannot be prevented, at least for several centuries to come. So why waste billions trying to do so when we can simply concentrate on adapting to the changes, whatever they may be, as they begin to happen. That way, if their models are wrong and nothing catastrophic happens, we won’t have to spend anything. We do not need any more climate science studies. We have heard it all going on 100 times now. Every possible disaster could happen. Do we really need to give someone another $1.0 million to come up with yet another recycled disaster scenario. There is no more point to it. We are just wasting money. Nothing new can come from any other studies. Cut it off. Unless they want to actually “measure” something and present some data. We just need to know what is really going on rather than one more single disaster climate model study. It seems most of these studies were written by wanna-be sci-fi screen writers trying to enter the disaster movie business. They are too busy trying to convince us that it is “settled science”,to notice they have run out of disaster scenarios. “Natural sources for Methane and CO2 are well known, and have been around for millennia.” Only thousands of years? How about eons? You wouldn’t want your critics thinking you’re a young Earther. So she’s saying greenhouse gases are like progressive ideologues and climate alarmists — the damage they do lingers long after they leave the scene. Huh?? The Coefficient of Thermal Expansion (CTE) is quite linear for most materials, especially over the range of only a few degrees. This means that once you turn off the source of the heating, the net expansion has already occurred, no mater how it is distributed. The expansion can’t “go deeper” without offsetting contraction where it had been. The net change in water volume is zero. Since the total thermal capacity of the ocean vastly exceeds that of the atmosphere, it is the ocean controlling the atmosphere temperature, not vise versa, once the atmospheric heat input stabilizes. They are not methane hydrates, they are natural gas hydrates. they contain ethane, propane, butane, etc. Methane and Natural gas are used interchangeably but not accurately. Kieth J is correct about the remainder of his comment about clathrates. thick, in the case of the hydrates off the coast of N/S Carolina. Read essay Ice that Burns. About 10% of methane clathrate is thermogenic in origin, for example GoM. About 90% is biogenic, the methane formed by Archaea methanogen metabolism. For example, Japan’s Nankai trough. Your information is simply not correct. Yes, they are. Termites emit methane, as do most insects, and volcanoes and dead trees emit CO2. I don’t think you bothered to look into these natural sources you say don’t exist. and a picture of a paved boat ramp is relevant to what, precisely? Heck we have one of those just down the road in our little rural waterside settlement here in eastern Virginia. Most city dwellers have never seen a boat ramp, so a picture of a paved surface disappearing under the waves would be scary. If you give me a million dollars, I will produce a study on why that might be happening. Of course my research will involve spending lots of times on boats, preferably equipped with a sufficient number of fishing rods. That was my immediate LoL reaction . Was it somehow connected with the paper or just chosen by Anthony ? This is where the boat went in with the drain plug left out! Several feet of water rise was recorded before testing stopped due to the boat disappearing! More to the point, a boat ramp needs to slope into the water in order to serve its intended purpose. Ever try to launch a boat from a trailer over a 12″ drop? Decades ago a colleague showed me that boat launch (and recovery) ramps attract fish. Have not seen the study that compares area covered with quantity. and release fisherman use to empty their live wells. emptied at the end of a tournament. I’ve got a spare bedroom I could rent out. What they really need to be planning for is where all the Canadians and northern US citizens are going to go when the next ice age hits. It’s models all the way down. Somebody has congenital misplaced faith given the history of model based climate predictions. CFCs? That boogyman again? It seems that the authors need to revisit organic chemistry, an undergrad course. Even chemistry 101 can help them. From chemistry 101 we learn that the lightest CFl4, much lighter than CCl4, is so much heavier than normal air molecules that it is very unlikely for significant amounts of it to waft into the stratosphere. From organic chemistry we learn that the halogen elements have such strong affinity for carbon that they will even tear other molecules apart to attach to the carbons. In sufficient quantities, the halogens will tear apart bacteria, which is why iodine is used as an antiseptic on wounds and chlorine is added to city water systems. Ozone is a known, unstable chemical that breaks down over time, with a half life from minutes to a few hours depending on conditions. It is constantly replenished by absorbing some UV light. Therefore, over the Antarctic in winter where there is no UV to replenish ozone, can we expect the ozone levels to stay the same? Add to that that the major CFC scare happened shortly after major volcanic eruptions injected many megatons of unstable HCl and HFl directly into the stratosphere, where they combined with the CO2 in the atmosphere, what do you expect will happen? Knowing elementary chemistry, how does that affect the understanding? And methane? Can we do the same sort of analysis? Chemistry 101 teaches you the kinetic theory of gases. It follows from that that diffusion will happen from high pressure/concentration to low pressure/concentration. Kinetic theory of gases tells you that all gases are miscible. Like the ‘heavy’ drop of soluble ink in water, the water will get a uniform color through diffusion and mixing. Quiz. What is the velocity of carbon tetrachloride at STP and what is the velocity of oxygen at STP? Hint: thermodynamic temperature is the geometric mean of the kinetic energies of the sample’s constituents. Some may recall my post about Ruminomics/Methane research in 2012. The project was predicated on the conjecture that CH4 would cause dangerous global warming and its secured funding to the tune of £7m of taxpayers’ money from the EU. it was to investigate methods of reducing bovine emissions of CH4. The project ran until Dec ’15 and the final report given – you’ve guessed it – at the Paris COP. I have been waiting ever since to read a published account of it, particularly how the study would relate to reducing global temperatures. So far I have not seen any report. Perhaps someone has more information. Hopefully Brexit may stop some of this total waste of our money. Michael, the State of California just passed legislation requiring ranchers raising cattle to curb CH4 emissions, AKA cow farts, though there’s no known way to do that. So even if reports like yours don’t get a lot of publicity, rest assured they’re being used as weapons against the general population. If they can regulate C02, don’t think for even one lingering second that they won’t regulate any other trace gas they can. As if regulating C02 didn’t already give them direct claim to authority of all life on the planet. But I’m sure NO ONE would EVER abuse such authority. Certainly not the control freaks who WANT it. I really wish climate scientists would learn at least the basic rudiments of control theory. They dismiss any criticism from someone who does not have a degree in “climate science” on the basis they do not know what they are talking about yet they make the most basic errors in their advocacy. The claim is that because the oceans have a very long time constant the impact of a short term change could linger for a long time. Sure, imagine you have a tank of water with a very small hole. Dump a bucket of water into the tank and the level goes up and it takes a long time to go down again. That’s a system with a long time constant but the point is that the maximum impact occurs immediately you stop adding water, from then on the perturbation diminishes. Thus with a short lived ghg such as CFC’s the maximum impact occurs at the end of the short term perturbation. If that’s say 1/2 a mm then that’s the MAXIMUM total impact even if it takes 1000 years to subside. But that’s not what they are claiming. They claim that the impact continues to grow for centuries AFTER the perturbation ceases. That means they are claiming absolutely stupendous massive positive feedback in the climate system. A tiny trigger can be hugely amplified by the system response. Consider, if the initial impact is half a mm yet they claim the cumulative impact could be half a foot – 150mm – they are claiming a positive feedback system gain of 300. Any control engineer can tell you that a system with that degree of positive feedback would show huge massive overshoots and instabilities to input stimulations. Yet the same people making such outlandish claims also say the climate system has been stable for millions of years prior to man’s “meddling”. Quite apart from the fact that natural systems nearly all show strong negative (stabilising feedback) the joint claims of massive positive feedback and stability for millions of years are simply mutually contradictory. CO2 is not the same scare anymore, it has been misused. Some new scares have to be found, and here they are. Methane and CFC. Accidification of the ocean seems also to loose weight, so some new have to be invented. Unfortunately few of them is yet connected to GW or climate change, but just wait. Those who seek will find. I’m not holding my breath for that. To: Michael Hammer – Your comment on feedback and control theory. A very straightforward and clear explaination of control theory, it’s relation to climate and what really happens in the real world. As an engineer used to applying common sense to any analytical process learned in my field, I appreciate such explanations after reading so much technical gobbledygook on the whole climate debate when we understand so little about the complex and chaotic systems on our planet. As I have said many times to many of my friends; as humans, we are just at the beginning of a long process of understanding the complexity of our world. I love these sort of articles because what they indicate is the sheer futility of trying to do anything about global warming. Therefore we should just stop spending any more trying to change things. In fact seeing our demise is so inevitable maybe we should double down and build coal fired plants at an even greater rate. Maybe then a whole lot of people could be freed from poverty even if we totally destroy places like Tuvalu as a consequence. They are dead wrong about that “continued thermal expansion.” If you take the top hunddred or two hundred meters of water and mix it with the four kilometers below it the resulting water temperature will differ only marginally from abyssal temperatureof near zero Celsius. That mixed layerwill not have the same vgolume as the total of former two layers had andyou shouldv expect the total volume of the mixture to actually shrink when compared to the original. There is also the p[roblem that thgere is no way to createthis mixed volume. It is actually simp;le: warm water will not sink below a cold water that is close to zero Celsius. This is not a sterile theory like theirs but can be observed every day in the Atlantic Ocean. You may have heard that the Gulf Stream warms Norethern Europe by carrying warm water from the Gulf of Mexico into the North Sea. Ben Franklin was the first to figure it out.That is some thousands of miles away and it works simply because warm water will not sink below cold water and stays on the surface. The Gulf Stream enters the Atlantic Ocean through the Florida Strait located between Florida and the island of Cuba. It continues north paralle4l to the east coast and is then diverted eastnear Main andthe Canadian islands, into the North Sea. IKt sprt5eaqds out, warms the air above it and it is this warm air carried by winds into Europe that gives it a mild climate. But something unexpected happened at tyhe turn of the twentietjh century. The North Atlantic ocean current system got reorganized and started sending part of this Gulf Stream durectly into the Arctic Ocean. As a result, the Arctic is warming twice as fast now as the rest of the world is, all because of the warm wate rcarried to it from the Gulf of Mexico. That is over a thousand miles, without mixing with the abyssal cold water below it. Their claim that warm water on the surface can mix with the cold water below is thereby proiven to be plain wrong. That makes their claim a two way loser. Tirst it is impossible to mix warm and cold ocean waters as the Gulf Stream poroves, and second, if you could, you would not get a sea level rise but water will retreat finstead. And one more thing. The warm water going into the Arctic will eventually cool, sink to the bottom, and flow south along the bottom. I wonder just how much the tears from the Democrats has contributed to sea level rise? Not me, brother. I live at 4700 feet ASL. Remember when the brilliant Sam Kinison (RIP) advised sending the Ethiopians luggage? “Move! Go where there’s food, for God’s sake!” How about we send the Tuvaluans some lifeboats? Remember that the last intergalcial period was warmer than this one with more ice cap melting and higher sea levels and it had nothing to do with mankind’s use of fossil fuels or natural emmission of Methane. The last ice age still followed. A much greater sea level rise was from the coldest part of the last ice age to the beginning of the Holocene some 10,000 years ago. Sea level chage druing the past 10,000 years has been trivial compared to what happened the previous 10,000 years and it had nothing to do with Mankind. If one wants to blame a so called greenhouse gas then H2O has got to be your culprit. During all past sea level rise events, signiificant amounts of H2O, more than any other greenhouse gas, have been in the atmosphere and the H2O molecule is a stronger IR absorber than CO2. Rather than trying to reduce the amounts of CO2 and CH4 in our atmosphere we should be trying to reduce the amount of H2O in our atmosphere. Bodies of water and wet ground can be covered in plastic. Devices that condense H2O out of the atmosphere are in common use ant theri use can be intensified. The H2O molecule can easily be gotten rid of by electorlisis. Laws can be passed making H2O polution and H2O possession, fellonies. Major efforts can be made to cure people of H2O adiction. Actually it can be shown that of the gasses in the Earth’s atmopshere, N2 contributes most to global warming and has the highest climate sensivity. Think of all the global warming that would occour if the amount of N2 in the Earth’s atmosphere were doubled. Forget CO2, it’s the CFC’s and other gasses that will usher our doom! A breath-holding, action-pack description of the outcome relating to the release of CFC into the atmosphere during the past 40 years is available in the must-read novel “Shield Of Life”.